St Patrick’s Cathedral, the third attempt at building a church on its site was begun in 1858 and its spires were finally completed in 1939. You can read an illustrated history of the Cathedral on another page in this site. Its architect was gifted English Catholic, William Wardell and St Patrick’s Cathedral is the building for which he is most widely remembered. The Cathedral sits on a block in East Melbourne bounded by Albert, Lansdowne and Gisborne Streets and Cathedral Place. It is an imposing building made from bluestone, the bedrock of Melbourne itself. Lighter stone is used in the trim of the building and this has been carved intricately to give the external aspects of the Cathedral great interest. The spires, pinnacles and gargoyles fascinate visitors especially the modern gargoyle of former Victorian Premier Jeff Kennett. Other dragon-like carvings around the Cathedral are identified on this site (scroll through the article to Hidden Dragon No 4). The Cathedral is orientated to the North East and its main doors open towards the city. Churches are often orientated towards the East as a symbolic sign of waiting on and being prepared for the second coming of Jesus but even when the altar end of the church is not actually facing towards the east the altar end is always called the liturgical east end. Once inside St Patrick’s, the quality of the light and the wonderful dimensions of the interior of the building become apparent. The floor plan of the cathedral is a simple one. It is in the shape of a Latin cross. The nave and sanctuary (the area on which the altar stands) form the longer axis of the cross and the transept forms the shorter axis (the arms) of the cross. After you have explored St Patrick’s Cathedral you might like to look at another William Wardell Cathedral, St Mary’s Hobart. This site contains a ‘Kid’s Tour’ of St Mary’s Cathedral and an A to Z of key terms. The altar, a symbol of Christ, is the focus of the whole cathedral. It is located beneath the main tower and spire, where nave and transept intersect. Architecture and decoration together indicate that this is the most sacred part of the building. St Patrick’s altar is made of Portuguese marble and features panels carved by Melbourne sculptor Peter Schipperheyn. Notice how many pedestals and panels support the altar. What might these signify? What do you think the interlaced circles and the grapes and grain carved into the front of the altar frontal represent? Within any church, the altar is the chief architectural symbol of Christ. In St Patrick’s, the altar’s location at the intersection or crossing of the nave and transept (which in turn represent the four points of the compass, north, south, east and west) suggests Christ at the heart of the church and at the centre of all creation. • the table of the Lord. St Ambrose of Milan way back in the 4th Century wrote: “For what is the altar of Christ if not the image of the Body of Christ?” Both St Ambrose and the Catechism are using symbolic language here. You can read a little more about the meaning of symbols and symbolism in this helpful article by Fr Anthony Kain and more about the significance of the altar in the liturgy here. The part of the Cathedral where the altar is located is called the sanctuary. It is raised slightly so that members of the congregation can see and participate in the sacred action more easily. The floor of St Patrick’s sanctuary is particularly beautiful. Four mosaic representations of the evangelists based on designs from the great Irish book of the gospels, the Book of Kells, surround the altar. The four winged creatures are quite stylised so have a good look at the illustrations in the Book of Kells site so you will recognise them when you go to St Patrick’s. • the lion’s curly golden mane? • the striped and spotted ox with the yellow tail? • the beautiful blue of the eagle’s body? • the man’s robe decorated with triangles? Because the sanctuary floor is raised, the mosaics are quite difficult to see but glimpses can be caught from the steps on either side. The symbol of St Matthew (the winged man) is in front of the altar. Can you catch a glimpse of the symbols of the others and identify them? This site explains the symbols a little further. The white marble crucifix on a pillar to the left of the altar, is a symbol of the mystery of the death and resurrection of Christ and a sign of God’s love for the world. It was obtained for the Cathedral by Melbourne’s first Archbishop, James Goold. The cross is the most instantly recognisable sign of Christianity. The Cathedral’s cross is called a crucifix because it has a representation of the body of Jesus attached to it. It hangs on the pillar beside the altar to remind people of the connection between the death of Jesus and the meaning of the Mass. This white marble crucifix was made by a German sculptor Wilhelm Achtermann and was first installed in the sanctuary in 1869 by Archbishop Goold. In the ancient Roman world the cross was a symbol of torture and humiliation since it was the way criminals were punished and put to death but for Christians it became a symbol of the life out of death that Christ won for us through his death and resurrection. 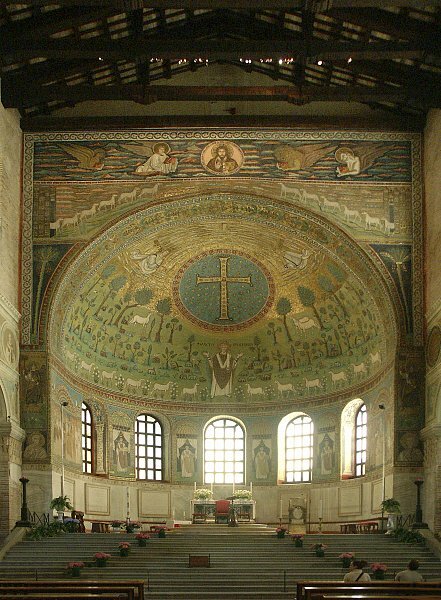 In early Church buildings (for example in the apse mosaic of St Apollinaire in Classe in Ravenna consecrated in 549) the cross was usually depicted without the figure of Christ. The cross itself was ornamented and decorated as a symbol of the victory over death and sin. The first crucifixes (crosses with the figure of Jesus attached) date from around 600 A.D. In the early Middle Ages, the body of Christ on the cross showed little suffering and was dressed and victorious upon the cross. Later depictions showed Jesus stripped and wounded but serene and loving, his body relaxed against the cross. The San Damiano cross beloved of St Francis of Assisi is a well-known example of this style of cross. By the high Middle Ages, the figure of Christ on the cross became tortured and anguished, a vivid reminder of the fact that Jesus was a human being as well as the Son of God and that his sufferings were very real and painful. This kind of cross was intended to moved the beholder to sorrow for sin and so to repentance. During the Renaissance, interest in the human body and human emotions led to more realistic depictions of the crucifixion while later still in the 19th Century the anguish of Jesus was sublimated and sometimes sentimentalised. Calm resignation characterised most crucifixes made in this period. The 20th Century saw many more representations of Christ crucified and non-European interpretations became more widely known. The Textweek site contains many images of the crucifixion from a variety of eras. The vertical and horizontal axes of the cross are often said to represent the two key teachings of Jesus: love of God (the vertical dimension of the cross) and love of neighbour (the horizontal dimension). For Christians, Jesus himself is the perfect example of both dimensions of love. The axes of the cross can also represent time and eternity with Jesus’ death and resurrection constituting the intersecting point of both. For further reading see Cross and Crucifix a well researched and well illustrated site. Where does the St Patrick’s crucifix fit into the historical outline? What other cruciform shapes can you see in the Cathedral? The Blessed Sacrament Chapel is the most richly decorated of all the chapels, featuring many fine mosaics and stained glass windows depicting scenes and symbols that relate to the meaning of the Eucharist. The art and fittings of this chapel reflect on and teach about the meaning of the Blessed Sacrament (see also a reflection by Pope Benedict) and the mystery of the Eucharist. in the top rank, the death of Jesus on the cross, represented and celebrated at every Mass, flanked by the transfiguration of Jesus the foretaste of his resurrection and the resurrection itself. below these, a depiction of the Last Supper in which Jesus identified the bread and wine of his last meal with the giving of his body and shedding of his blood on the cross the next day. This is flanked by two Eucharistic symbols, one from the Old Testament: the serpent raised on a standard (Numbers) which cured all who looked upon it and one from the New Testament: the Lamb who was slain (Revelation) enthroned on the book of life. below these, a mosaic of Jesus feeding the multitude (partly obscured by canopy above the tabernacle) is flanked by depictions of Moses through the power of God providing food and water for the chosen people in the midst of the desert. The beautiful tabernacle door depicts a pelican piercing her breast to feed her chicks with her blood. This is a reference to Jesus’ self giving on the cross and his feeding of us with his body and blood in the eucharist. The pelican motif is repeated on the carved marble canopy above the tabernacle. This chapel celebrates the mystery of the Blessed Sacrament, the faith of the Church that Jesus chose to use simple substances of bread and wine to be the sacrament of his real and enduring presence among his people. The two stained glass windows in this chapel represent two scriptural scenes relating to bread and wine. The window to the left illustrates an Old Testament reference Genesis 14:18-20. It shows the priest Melchisedek presenting bread and wine to Abraham. In the window next to it, Jesus takes bread and wine at the last supper and makes of them sacraments of his body and blood. These windows were made in the studio of Franz Meyer of Munich Germany. All the other stained glass in the Cathedral comes from Hardman of Birmingham in England. Notice the differences in colouring between the two styles. In every Catholic Church, the Blessed Sacrament is reserved for the sick and as a focus for the prayer and adoration of the people. Although this chapel is dedicated to the mystery of the Blessed Sacrament, the Sacrament is not reserved in this chapel but in the tabernacle of the High Altar at the back of the sanctuary. See also the High Altar notes. The font, in which new Christians are baptised, is situated in the baptistery near the main entrance to the Cathedral. Its location symbolises the entry of the newly baptised into the Christian community. The baptismal font is located in the Baptistery just inside the Cathedral doors at its Western end. In former times, candidates for Baptism would turn towards the West to renounce evil and then turn to the East in hope of the dawn of the Second Coming to pronounce their affirmation of the Creed. This photo of the font at St Patrick’s is taken from inside the Baptistery looking out through the grille towards the Cathedral doors. The baptistery is cut off from the body of the Cathedral by a grille which represents the barrier to belonging of those who are not baptised. In early Christianity, those who were not baptised were not admitted to the body of the church prior to baptism. Some separate baptisteries in ancient churches are still in use but since the Middle Ages, most baptismal fonts have been located within the church building itself. St Patrick’s font is a beautifully carved octagonal basin made by a 19th century Melbourne craftsman. Representations of the four evangelists interspersed with angels, some holding instruments of the passion, others rejoicing over the newly baptised decorate its eight panels. Defeated demons writhe around its base. Can you make out which of the symbols of the evangelists carved on the side of the font is facing the camera? As so often numbers are significant. The eight-sided shape of the font refers to a longstanding Christian tradition of reflecting on the “eighth day”. Seven represents the number of earthly perfection and completion. According to Genesis the world was created in seven days. So the eighth day represents the beginning of a new time, the time beyond time: eternity. The one being baptised enters into the “eighth day” of eternity where Christ’s reign of peace and justice is celebrated. Baptism sets the new Christian on the path to that life that will never end because it is the life of the Risen Christ. The basin is a symbolic ‘tomb’ because those who are washed in its waters die to their old life and come forth as a ‘new creation’ in Christ and so it is also a symbolic ‘womb’ because from it new sons and daughters of the Church are born. Sometimes the rounded shape of the bowl suggests its womb-like connotations. You might be interested to compare St Patrick’s font to some ancient and modern ones on a slideshow or to read more about the sacrament of baptism in another part of this site. An eagle, a dove, a serpent in a trefoil pattern and emblems of water feature in the inlay and are an example of how the religious symbolism of both Aboriginal and Christian traditions enrich each other. The Aboriginal Inlay, placed before the steps and main entrance so that all can acknowledge and remember the thousands of years of Aboriginal presence on the land on which the Cathedral is built, is a gift of the Aboriginal Catholic Ministry. It was designed and crafted by Glen Romanis and Megan Evans. Bunjil the eagle, creative Spirit of the Wurundjeri People, the first people of the land on which St Patrick’s is built parallels the creative Spirit of the Genesis narrative (often represented in Christian art as a dove). The eagle also evokes the Old Testament image of God as a mother eagle supporting her young as they learn to fly and of the majesty of God’s power. The serpent has ambiguous connotations in both Indigenous tradition and in Judaeo-Christian tradition. A snake is the tempter in the garden of Eden certainly but it is also is an emblem of healing in the story of the Israelites in the desert (If you visit the Cathedral, search the images on the grille gates in front of the Cathedral doors to find an image of this serpent. Also see if you can spot the same serpent motif in the Blessed Sacrament Chapel). Conversely, in the Dreaming stories of certain Aboriginal groups, the rainbow serpent is a powerful creative spirit but it can also be capricious and cause death to those who do not obey the laws. In the local Wurundgeri tradition, the snake Myndii maintains the law and keeps an eye out for Bunjil on what people are up to. In the inlay the snake is seen coiled in a trefoil shape which recalls St Patrick’s use of the shamrock (or trefoil) to teach about the the mystery of the Trinity. The cathedral has many other examples of the trefoil motif in its decoration. Be alert for these. Serpent, dove and eagle are superimposed over incised rock representing water, the element without which neither human beings nor the natural world could exist at all. Both traditions draw on the life-giving (and death dealing) aspects of water in their religious practices. Read some Aboriginal water stories or other stories of the Dreaming as well as the account of creation in Genesis. The lines represent the five language groups within the Kulin Nation: the Woiwurrung, the Boon Wurrung, the Wathaurong, Dja Dja Wrung and the Taungerong. The organ supports and enriches the liturgy of the Cathedral. St Patrick’s organ was built by Melbourne organ builder George Fincham and has 4762 pipes plus a beautiful set of Spanish trumpets. Few experiences are more stirring than walking into the cathedral while the organ is playing. It has a remarkable capacity to convey emotions. Whether it’s expressing the majesty of Bach, the gentleness of Brahms, the prayerfulness of a modern psalm setting or communion song or accompanying Gregorian chantthe organ has the capacity to touch hearts. Perhaps this is why it plays such a privileged role in the liturgical life of the church. St Patrick’s organ is a pipe organ rebuilt in 1964 by George Fincham a Melbourne organ builder. It commemorated the 50th Anniversary, in 1962, of the consecration of Archbishop Daniel Mannix as a bishop and is also a memorial to all those who died for their country in war. It is played at all solemn Masses at the Cathedral and at many other Masses and celebrations as well as at the concerts that occasionally take place in St Patrick’s. Organ music is produced by air passing through pipes. The organist controls the sound by playing the keys or pedals to operate the valves. Each pipe produces one note. The organ is a complex instrument to learn and requires much practice and good co-ordination because both hands and feet are involved in producing the sound. The keyboards, played by the hands, are called manuals. The notes on the pedals are played by the organist’s feet. Banks of stops to the right and left of the keyboard, when operated by the organist, produce different sounds and effects. Pope Benedict has said of this instrument: ‘The organ is known as the king of musical instruments because it can produce all the sounds of creation; it gives resonance to the fullness of human sentiments and it evokes the divine’. The Holy Souls’ Chapel contains the tombs of Melbourne’s first Archbishop, James Goold and the first Dean of the Cathedral John Fitzpatrick. It is dedicated to the Holy Souls: all those who die in the hope of seeing God. This chapel is dedicated to remembering and praying for the Holy Souls, that is, all who have died hoping in God, that they might share the eternal life of God. The Latin words on the arch above the chapel may be translated as ‘Blessed are the dead who died in the Lord’. In this chapel two plaques on either side of the chapel commemorate the first Archbishop of Melbourne James Goold and the first Dean (the priest, appointed by the bishop, who has special responsibility for the Cathedral itself) John Fitzpatrick who are buried here. The carvings below and above the altar are very appropriate because the former shows Jesus being laid in his tomb just as the Archbishop and Dean were in laid in their tombs in this chapel in 1888 and 1890 respectively. The carving above altar depicts the resurrection of Jesus in which the Archbishop and Dean and all Christians who have died, hope to share. The stained glass echoes this with a scene of the crucifixion of Jesus flanked by representations of his resurrection and ascension. This chapel celebrates the fact that the Church is not limited by time or space but embraces all those, alive or dead, who have been baptised. This familial relationship of all members of the Church is called the communion of saints. Belief in the communion of saints assures us that there is a bond of love and care that extends beyond death between all those who have sought God with sincere hearts. Members of this communion who die are not cut off from it but remain part of the family of the Church. The dead are remembered and prayed for daily at every single Mass, and by all who visit this chapel, that they will be purified and become capable of that union with God which is the goal of human life. The condition or state of being purified is referred to in the church as purgatory. Purgatory is not a quasi geographical location but a stage of conversion to love. Living members of the Church pray for those who have died and are, in turn, assured of the help, in their life and work, of all the saints who share the life of God. Saints of every era of history, known and unknown, are a source of inspiration and support to present day members of the church. The Ladye Chapel is the largest of the seven chapels surrounding the sanctuary. Dedicated to Mary, Mother of God and first among the faithful, it contains a very beautiful marble statue of Mary and the infant Jesus. The chapel of Our Lady is situated on the axis of the Cathedral directly behind the high altar indicating the unique place Mary, the Mother of God holds in Catholic theology and devotion. The main panels of the stained glass windows in this chapel highlight Mary’s role in the Incarnation depicting as they do: the Annunciation, the Visitation, the Nativity, the Presentation in the Temple and the Adoration of the Magi. Above these are angels bearing titles of Mary, while beneath are depictions of the great women of the Old Testament: Eve, Sarah, Miriam, Deborah, Judith, Esther, Queen of Sheba, Ruth, daughter of Jephthah and the Mother of the Maccabees, each of whose stories are in some way reflected in Mary’s story. In the small quatrefoil windows above are depictions of some of the mysteries of Mary: her own Immaculate Conception, her Motherhood, her Assumption and her Queenship. On the reredos of the altar are mosaics of the nativity and the crowning of Mary, Queen of Heaven while beneath the altar, symbols of Mary as Star of the Sea and Tower of David flank an embellished initial M which is repeated in the decoration of the walls of the Chapel. The doors of any church are significant because it is through them that we are “breathed in and out” of the church. The Cathedral’s main doors are protected by a beautiful bronze grille featuring St Patrick. Flanking St Patrick on the grille are two other Irish saints, Brigid and Columba. Their images pay tribute to the fact that the Church in Melbourne and this cathedral in particular was largely built on the efforts of Irish immigrants. Above the main entrance the papal insignia, crossed keys and papal tiara indicate that St Patrick’s Cathedral is a minor basilica. Jesus once referred to himself as the ‘gate of the sheepfold’, so the doors of the Cathedral (and of any church) symbolise him too. If Christians stayed always inside the church they would be prisoners or escapees from life and if they stayed always outside they would lose contact with what gives Christian life meaning and purpose. Jesus is the means by which we can both go in to be nourished and come out to share what we have received. Churches and the liturgies celebrated within them prefigure the reign of heaven where God is all in all and the whole cosmos is at peace and the tyrannies of space and time are overcome. Beauty, order, hospitality and a sense of the presence of God ought to characterise the interior of a church and this is very much true of the interior of St Patrick’s Cathedral. Beyond the church door exists the world with its almost inexhaustible range of interests, experiences and stimulation but also prone to all the things that threaten the human project: sin, separation, selfishness and ultimately death. The doors symbolise the passage from one mode into the other. At Baptism people walk or are carried in through the church doors to begin their life as Christians and they are carried out through them when their human life has ended. Every entry and departure recalls those moments. There are other formal moments too when Christians enter the Church as a body: for example, on Palm Sunday carrying palms to accompany the Lord to Jerusalem and his death and tentatively in the dark at the Easter Vigil, entering the church following a single flame, to celebrate his resurrection. The former high altar of the Cathedral houses the tabernacle which contains the Sacrament of the Body of Christ. Red lamps burn beside this altar signifying the sacramental presence of Christ. The high altar is at the far end of the sanctuary area of St Patrick’s. It was designed by the architect of the Cathedral, William Wardell and installed in 1897. It is made from Spanish and Irish Marble set with other precious stones: crystal, jasper, lapis lazuli and agates. Prior to the liturgical reforms of the Second Vatican Council this was the altar at which Mass was offered. The bishop or priest officiated ad orientum, that is, ‘facing east’ so both the people and the priest were facing the same direction. The tabernacle in which the Blessed Sacrament is reserved is surmounted by a cross and above this is a niche to house a monstrance where the Blessed Sacrament can be exposed for the veneration of the people. An alabaster canopy rises to a pinnacle over seven metres above the sanctuary floor. A small flight of stairs on each side of the altar provides access to the niche and can also be used by altar-servers when lighting the candles of the high altar. Four double columns of green Irish marble enclosing mosaics of Jesus, Mary and Joseph on the panels between support the altar table which weighs two and a half tons. The lectern is the stand from which the scriptures are proclaimed during the Liturgy. The lectionary book rests on the outspread wings of a golden eagle suggesting the majesty and power of the Word of God. This lectern, cast in brass in the shape of an eagle, was designed by Cathedral architect William Wardell. Its size and beauty highlights the dignity of the Liturgy of the Word within the Mass. The origins of the lectern trace back to the early Church where it was given a special place and reserved for the public proclamation of the scriptures and the subsequent preaching on those readings. As such it was something of a ‘sanctuary’ for the word of God..
For a significant time, especially prior to the use of microphones to amplify voices, large preaching pulpits – they looked like this – overshadowed the lectern especially in parish churches. But after the Second Vatican Council, the lectern as a ‘table of the Word’ was revived. It is not simply a bookstand, but ought to be substantial, meaningful and beautiful as a sign to those who see it that something important happens when it is approached. St Patrick’s lectern is in the shape of an eagle. Suggest reasons why a lectern might be shaped like this. What other eagles have you noticed around the Cathedral, inside or outside? Can you make connections between the significance of each of them? The Archbishop’s Chair is called in Latin the cathedra. It is from this chair that the whole building takes its name. It symbolises the Archbishop’s right to teach and lead his diocese and his role as leader of the Liturgy. The cathedra currently in use at St Patrick’s was made in the 1890s by the Nunan brothers from timber from the redgum tree that originally stood in the grounds of St Francis’ Church on the corner of Elizabeth and Swanston Sts. St Francis’ was Melbourne’s first Catholic church and the cathedral church of Bishop Goold until St Patrick’s was able to be used in 1868. This chair is a link between the two cathedral churches of Melbourne. The embroideries on the chair are modern and echo the mosaics on the sanctuary floor which are representations of the symbols of the evangelists found in the Book of Kells, a beautiful ancient Irish Gospel Book. From this cathedra the Archbishop presides over the liturgies and ceremonies of the Archdiocese. Bells became part of the life of the Church around AD 600. When Archbishop Goold was travelling in Europe in 1851-2, he purchased a peal of eight Irish bells. These were finally dedicated and hung in the Cathedral in 1868-9. When Bishop Goold purchased the bells, St Francis was the chief church in Melbourne. He wanted to install them there but their reverberation could have damaged the church. The tenor bell itself weighs 700 kilograms and the whole peal weighs 3556 kilograms. So St Francis’ church kept its bell hanging in a gum tree and the eight bells were put into storage until St Patrick’s was ready to receive them 16 years later. The main function of bells is to announce times of prayer especially the time of Mass and to mark special occasions and happenings. This is still the main function of the bells of St Patrick’s. Each Sunday the bells ring for the half hour before Solemn Mass at 11am and the bells are rung for weddings and from time to time tolled to mark the deaths of significant Melburnians. Quite recently the bell-ringers took part with other ringers throughout Melbourne in an event opening the Melbourne Arts Festival. The bells are hung in the belfry in the south tower at the western end of the Cathedral. A spiral staircase ascends to the belfry from behind a small door at the end of the south aisle. A plaque on the wall provides more information about the bells. The kind of ringing done at St Patrick’s is called change ringing. In contrast to a carillon or chimes which can ring tunes and be operated by a single person, change ringing requires a person for each bell and the bells are rung in sequences or ‘changes’ led by one of the team members. This creates a cascade of sound which is very stirring. Bell-ringing requires physical coordination, memory, rhythm and concentration but even though the bells are heavy and there is a physical effort involved, great strength is not a pre-requisite. Many bell-ringers are lightly built people. Have a look at this clip, Bell-ringing, it’s harder than it looks! to see how a young Englishman got the hang of ringing. You might also be interested in looking at this short video which shows how bells are made or at this animation which shows the mechanics of how the bells are rung. A general site answers some FAQs. On the walls of the Archbishops’ Corner in the northern transept are plaques recording the lives and service of former Archbishops who have died and are buried (except for Archbishops Goold and Carr) in the crypt beneath the transept. This corner is devoted to the memory of all the archbishops of Melbourne including those who have died. An archbishop is the bishop of a province of the Church which is a group of dioceses with a connection, usually geographical. In the early days of the colony, the Diocese of Melbourne led by Bishop Goold was responsible for the oversight of the whole of Victoria. As the Catholic population grew, the dioceses of Ballarat, Sandhurst and Sale were established with their own bishops and Melbourne became an Archdiocese and Bishop Goold became Archbishop Goold. Bishops (and archbishops) are responsible for teaching, preaching and enabling in every way possible the flourishing of the faith in their dioceses. They work in communion with the Pope and the other bishops to maintain the unity of the church and spread the gospel throughout the world. Priests share in the ministry of the bishop and lead and organise the parishes to which they are appointed. The pope, bishops and priests are ordained members of the church drawn from the people of God to serve the people of God. The organisation of the Church is often referred to as a hierarchy. The Pope, the Bishop of Rome, is called ‘first among equals’. His role reflects Peter’s role among the first band of apostles. After the Pope are the bishops, then priests, then deacons. It is a way of governing the Church to maximise unity of belief and has its origins in the scriptures and practice of the early church. Interestingly, Cardinals are usually senior bishops appointed to various tasks and roles by the Pope but being a Cardinal requires no particular ordination and a couple of Cardinals in history of the church have actually been laymen. This article on the Papacy gives a brief overview of the role of the Pope throughout history while this siteprovides a brief definition of terms like diocese, province, parish. You can read more about Melbourne’s own Archbishops on the St Patrick’s Cathedral site. A small monument surmounted by a mitre, the distinctive ceremonial headwear of bishops stands above the crypt where all the former Archbishops of Melbourne except Drs Goold and Carr (they are buried elsewhere in the Cathedral), are buried. This detail from the Great West Window shows Christ ascending to God in glory. It is the last image seen as people leave the cathedral, reminding them that Jesus lives and reigns for all eternity. The Ascension is often depicted in the western windows of churches because it associates the last moments of the earthly presence of Jesus Christ with the daily setting of the sun. Mediator between God and man, judge of the world and Lord of hosts, he ascended, not to distance himself from our lowly state but that we, his members, might be confident of followingwhere he, our Head and Founder, has gone before. You can read a description of the Great West Window which was installed in 1867, on the St Patrick’s Cathedral site. Tradition has it that the depiction of St John’s face is modelled on the face of Fr Patrick Geoghegan, Melbourne’s first priest. On the same page is a brief outline of the stained glass windows in the other chapels. Stained glass is an important feature of Gothic architecture and is not only beautiful but full of references to the great stories of faith both in Scripture and in the lives of holy men and women throughout the 2000 year history of the Church. However the glass in the nave of St Patrick’s deliberately uses amber glass formed of panes of various colours from yellow and ochre to soft shades of pink to capture the wonderful warm glow of the Australian sun. These windows illuminate the nave in a way that would not happen if stained glass was used throughout. To appreciate the difference, compare the light in the nave of the cathedral with the light in the chapels. A watercourse originates in a circular bowl enclosing a golden Lamb located outside the southern entrance. Water overflows through three outlets and down seven steps before flowing on down to street level. The Fountain: The source of the water is a circular raised basin with three outlets. Why circular? Why three? The Paschal Lamb: Inside the basin, submerged beneath the water, is a golden medallion of the Paschal Lamb whose head is turned towards a cross. Who do you think this Lamb represents and what is the significance of the symbol? The Chi-Rho: At the top of the Cross is a small ‘p’ which enriches the symbol of the cross further by making it also represent the first two letters of the word Christ in Greek: Chi (X) Rho (P). (The whole word is XPICTOC.) The Chi-Rho symbol, X with the P superimposed on it was often used as a secret code by early Christians and is now a common cipher for the word Christ. There is another Chi-Rho at the end of the water-course. At the Easter Vigil Christ is proclaimed as the Beginning and the End. from the throne of God and of the Lamb. This fountain proclaims Christ as the source of the Water of Life. The seven steps: The water flows down seven steps before entering the water-course. These recall both the steps taken down into the water by baptismal candidates and also the seven sacraments through which grace is poured out on the faithful throughout the time of the Church. of ceaseless prayer, impetuous desire.